Love and Life at Leadora: Happy New Year! I love the graphic. Have a wonderful year Heather!!! I am happy to have meet you in 2010. Happy New Year! May 2011 be filled with more great memories and successes. Happy New Year to you! We are planning a small get-together with a few couples at our home (we never go out on this night). We are supposed to get up to a foot of new snow today, so hope everyone can make it! I wish you lots of happy times in this new year. SO much fun finding your blog. That is a cute image. I don't think the champagne bottle would hold me though. 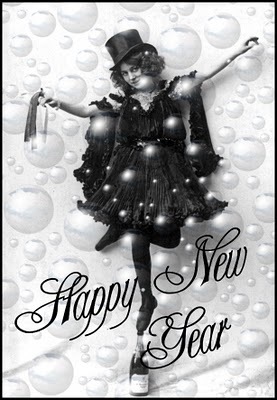 Hope you have a great 2011. Happy New Year Heather! Wishing you, all the very best for this brand new year. It was a pleasure meeting you in 2010 and I look forward to getting to know eachother more through our blogs in 2011 :-) Have a wonderful day my friend...Oh, but before I go. I made my count down clock on a program called Jasc Paint Shop Pro 9. It came with an animation program...Love this program. It's what I used to may my disappearing ghost in my Halloween post and my glittering butterfly on my sidebar and other stuff. It's kinda like making a little movie...frame by frame. It is so much fun. I'm so glad you liked it. I love the new header, it is perfect for January...the number one on the tin for the first month of the year, the clock, plus the colors, make it all seem so 'wintery' ~ you are just too cleaver! Happy New Year Heather! I am loving your new header:) Bravo! That's how we celebrate, with just a quiet family evening. Heck we never even see midnight! Happy New Year, and the new header looks great!